Although I use a small purse, because I don’t want to carry a lot of “stuff” around, it’s often inside a bigger bag. The big bag is necessary because I strongly believe in traveling with a book (or two, or three). No need to point it out, I can see the contradiction. The intent is that if I have any spare time I can use it to read (e.g. waiting for an appointment, on a coffee break, etc.). Unconsciously I probably believe having a book in relative proximity to me will make me smarter through osmosis or something. Most recently I have been reading The Accidental Masterpiece, On the Art of Life and Vice Vera by Michael Kimmelman. The book is a series of essays each one taking a slightly different perspective on life as art. Although the material is substantive it reads smoothly and with a gentle ease often lost in this type of philosophical art critic. The content was entertaining and could lead to an extended lunch in order to complete the last few pages of a chapter. But in the end the overall book was not memorable. I can recall to you high level themes; art of collecting, simple pleasures or the art of making a world, but int he end the imprint this book made on me was shallow. Is was an entertaining but not a life changing read. Who knows, maybe in two or three years I'll pick this book up off the shelf and read it again with a different perspective. We all have preferred ways of working. I do my better work when I'm by myself for long periods of time. I can think things through, take notes, come back to problems later with a clear mind. This is probably why fusing apples to me ( I have time to analyze) and flame working frustrates me (you have to make coordinated decisions in a split second). Well, the last few weeks my life has taken directions that take me way... way out of my comfort zone. You may already know (or not) that my husband and I opened a restaurant January first. It has been great to see my husband in his element, but for me it has been a complete learning experience. The first week I was like a deer in headlights. Cars were speeding by me and I was just standing there, not knowing what to do. But little by little I'm learning; how to turn off my normal tunnel vision and see/hear more then just one thing at a time, how to react and more importantly how to carry more then one thing at a time. I can see how expanding my mind and body to work in this environment will help me with glass, specifically making components for fusing in the flame. In the mean time, I can also apply some of my skills (e.g. web design, photography, administrative) to help with the restaurant. The strange thing is that after almost a month out of the studio it took a little personal push to get back in. I guess in the end we are most comfortable in whatever we are currently doing. The best way to expand your comfort zone is just to keep trying new things, to keep learning, to keep looking at the world from a new perspective. I am aware I have been absent from both the web and glass in general for the 4-6 weeks. I haven't fallen off the face of the earth, just got rapped up in another project. Over the last six months my Husband and I had been planning to open a restaurant. During his carrier, David has opened and run restaurants for other people and companies. It was time now to do it for himself. So, January 1st we opened the doors of the historic building on Highway 281 North that once housed Ferdie's. My Place Bar & Grille was born. It has been an exciting but all consuming adventure. Every waking moment the last six weeks seems to have gone to some type of restaurant related function. My creative moments once spent on glass turned to assisting with menu development, photographing food or working on the website. I have learned so much and know I have so much more to learn in order to help David achieve his goals. This does not mean I have forgotten my goals. This last weekend I taught Fusing I and II classes at Wired Designs Studio and it was a welcome opportunity to be back in the studio. As the restaurant develops I am working on the balance required for my own physical and spiritual health. Glass plays a healthy part in this. Over the next few months I am looking forward to teaching regular workshops at Wired Designs Studio, special events with Sweet Liberty Creations, exciting programs and events with the San Antonio Glass Art Guild (SAGAG), taking workshops and working on projects for the San Antonio Calligraphy Guild (SACG) Spring show and attending the Glass Craft Expo in Las Vegas in April. So much to do, so little time. But then again I have always liked to stay busy. A big thanks to everyone for their support. Specifically my fellow SAGAG member Denise who did a fabulous job with logo design for the restaurant. I am indebted to you. Thank you! Our first meeting of the year will be Thursday, January 31 at 6:30 P.M. What a wonderful time for existing members to plan for the future and for new members to jump in and take part. 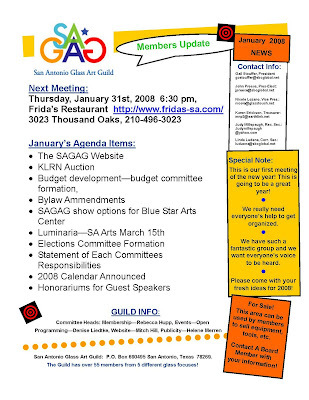 There will be all kinds of stuff on the table for discussion including participation in KLRN's annual blazing gavels event, the 2008 program schedule, updates on the SAGAG website and more. Not to mention the opportunity to get together with other glass artists for good food at Frida's on Thousand Oaks (map to Frida's). Hope to see you there.